VitalityHealth is a leading, innovative private health insurance company that rewards its customers for being healthy. As well as protecting customers when things go wrong, it also helps them lead a healthier life via a world-leading rewards programme. 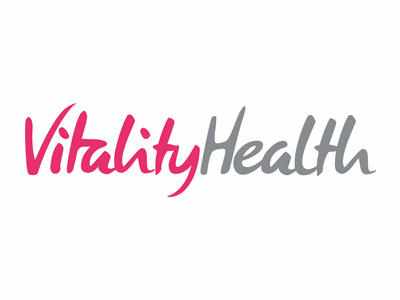 VitalityHealth commissioned us in 2015 to conduct its Voice of the Intermediary (VOI) programme with its brokers, utilising our Customer Relationship Quality (CRQTM) methodology. The process was repeated in 2016 to independently assess the progress made towards deepening the quality of relationships that VitalityHealth has with its key intermediaries. VitalityHealth recognises that occasionally measuring satisfaction is not enough in today’s complex and highly competitive intermediated business environment. In order to understand if brokers are committed for the long term, VitalityHealth deployed CRQTM to measure the level of Trust and Commitment at multiple levels within these broker relationships. The first year set the base-line and gave brokers a clear message of the company’s commitment to account management and service improvement. The second assessment confirmed that real progress had been made and spurred the business on towards a leadership position in the market. 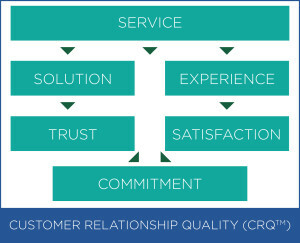 CRQ™ is a World-leading B2B-specific Voice of the Customer methodology to understand and manage long-term customer relationship quality and thereby improve sales and account management effectiveness. The model upon which it is based (illustrated) covers all the critical drivers of B2B relationships, recognising that such relationships are complex, multi-layered and time-bound. CRQ™ is an annual census of all broker-side customer contacts and stakeholders of the business. It is administered via an easy-to-complete, engaging online survey that quickly gets to the heart of what is and isn’t working well in the relationship from that individual’s perspective. It acts as an early-warning system to identify potential customer or account defections before they actually happen. High completion rates allow for sufficient granularity of feedback to individual client and account manager level. The second assessment delivered a clear positive message to the company that Trust, Commitment and Relationship Experience had all improved since the base-line was set. It also pinpointed some areas where improvement initiatives need to be seen through. Brokers remain committed because of the excellence of VitalityHealth’s proposition, which commands a competitive gap in the market. In both years, the results were workshopped within the sales and service communities to drive relationship quality improvements corporately and with individual brokers. “The CRQTM approach gave us quantitative and qualitative insights into our broker relationships that have been fundamental drivers of service improvements and sales growth.